Since I have very basic and limited knowledge on this topic, I wanted to start a discussion where more knowledgeable members can chime in. We all know that E39 across the range has the same MC, from 520i to M5. I recall that my old 530i had better brake pedal feel than all 3 M5's that I've owned. A friend and member here also feels that his 528i and E53 X5 have better pedal feel than his M5. When I say better brake pedal feel, I mean firmer pedal with less travel. At the moment, I have D2Racing 8 pot front BBK on my M5 installed by the previous owner. Ever since I first test drove the car, I couldn't shake the feeling that my previous M5, which had stock brake setup, had a better pedal feel. I thought it just needed a good flush and system bleed. I completed the setup with SS brake lines all around and bled the system multiple times using DIS and cycling the pump, while the braking power is great I feel the pedal travel is still too long and the pedal could be firmer. I was browsing the interweb and it appears that the E65 brake MC could be a direct bolt on for E39. 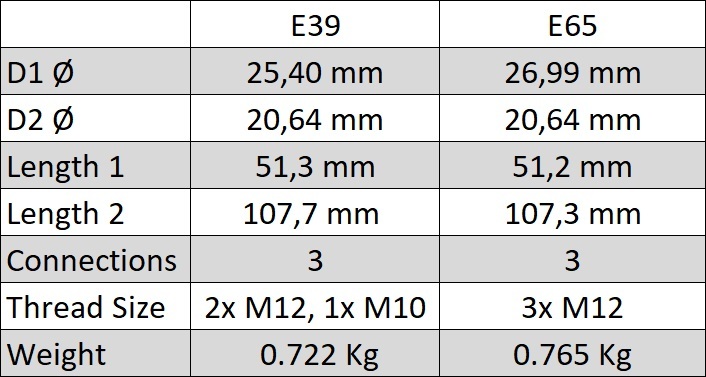 So front diameter on E65 MC is slightly bigger at 27 mm whereas E39 is 25,4 mm. 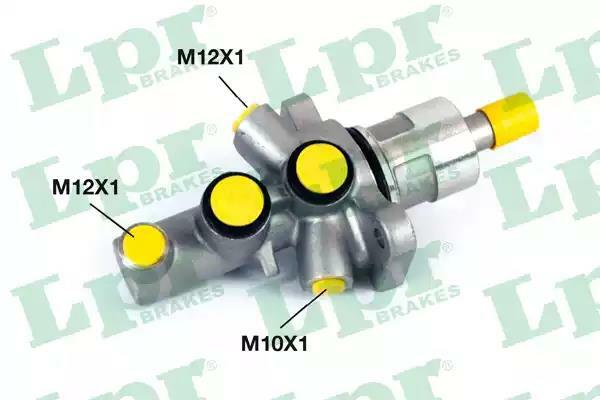 The obvious difference is that one fitting on E39 MC is M10 while all 3 on E65 are M12 but this could be solved with brake line adapter M12 to M10. Otherwise, they look physically identical. I understand the principle that larger means decreased pedal travel (firmer pedal) which needs more pressure for the same amount of braking force, but as I lack experience in this area, is this even worth exploring? Pricewise, both MC's are around $65 from TRW, at least in Europe. Before doing anything else, I'll try new pads likely Ferodo DS2500 as now I have Street/Sport pads that are supplied by default with D2Racing BBK. Sreten might be onto something here. While BMW does some great engineering sometime it seems that cost cutting department wins over engineering department during production. Especially as E39 seems to be about the last model (with its E46 and E38 brothers) where engineering almost always wins over cost cutting. I can't add much more to OP topic than this but hopefully some engineering heads here might. VDO oil pressure gauge * ZHP weighed shifter * Euro leather armrest * Spal electric fan * Bilstein B6 (stock springs retained) struts and shocks * Supersprint headers, HJS cats, X pipe, Vibrant Performance resonators, Supersprint Magnum mufflers and all new SS T304 Vibrant Performance mandrel bend tubing. This seems like it would improve the pedal feel on the car. Here are some others that I have found information on as well for discussion. Thanks! It looks like only the E65 is the same and plug n play for E39. The E60/E70 MC is different and has only 2 brake line connections so it wouldn't work. From the research I did, there should be some pedal feel improvement (more stiffness). It's popular with E30 guys to install E32 MC when they install BBK and get long pedal travel, going from 22 or 23.8 mm to 25.4 mm with E32 MC. I bought Ferodo DS2500 pads which should be delivered today. I'll pop them in first and drive them for a while. If I'm still unhappy with the pedal feel, it's cheap enough for me to try E65 master cylinder. Worst-case scenario, I don't feel any change with it at which point I have brand new MC that can stay on the car. I installed it on my M5 and look forward to the enhanced cooling this summer. I've seen your thread on it a while back. I'm digging that mode and will follow it for updates. It's actually cheaper to do this than to just buy new M5 fan clutch in Europe which I've done twice so far. Last edited by sreten; 7th March 2019 at 02:50 PM. Please keep us updated. I'm not happy with the brake feel on my M5 either. I'm not sure if it's flexing of the cheapo floating calipers or a too small MC. Before I gamble on a BBK to address potential flexing, it would be nice to know if I can get to where I want to be with an MC change. If you really want to fine-tune the feel of your brakes (and query whether that REALLY is an endeavor you want to dive into), delete your brake booster and replace it with a dual master cylinder bracket. 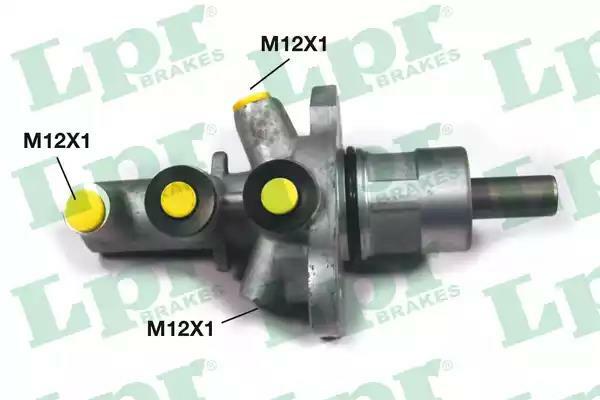 Then you will have the full selection of aftermarket master cylinder sizes from which to choose AND you can add a brake bias adjuster to the setup for further front to rear fine-tuning. Massive Lee makes a good bracket, though it make take a little fitment work to make it fit. May be more work than you want, but using a booster delete setup such as Massive Lee's is really the only way to get true adjustability for your brakes without going all the way and adding a pedal box. Just my $.02. Thanks for your input, Peter. That would be the right way to go about it but I don't want to do heavy modding. I suggested E65 MC because it's slightly bigger, cheap and easy bolt-on part. At the moment, I'm struggling to find brake pads that fit my stupid D2Racing BBK. 2 sets of Ferodo DS2500 delivered and none of the fit in the caliper properly despite proper dimensions and them being listed as correct pads for this application. Looks like I'll have to go with default D2Racing pads.